Located in the spot where the Rose Room used to reside is a new venture from Bobby Epstein (proprietor of the new ‘Muscoot Tavern) called Kisco River Eatery. I had the pleasure of dining there with friends over the Holidays and quite honestly, I can’t stop talking about this place. Kisco River Eatery has it all. The Bar was hopping with the Happy Hour Little Bites menu ($5 bucks). The Décor combines classic features like Tin ceiling panels, reclaimed Barn Board and sleek modern gas fireplaces; which add to the overall ambiance. The diner menu has something for everyone (salads, soups Fish, Hamburgers, BBQ Italian) they describe it as ‘Savory American fare with an Italian Twist’ and I would have to agree. 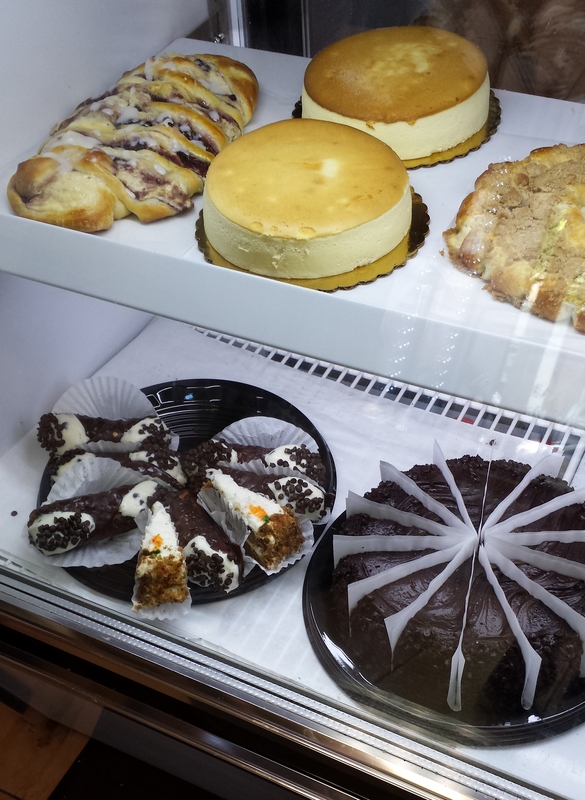 The Desert menu (all homemade) will not disappoint and all selections are only $7. I ordered the Short Rib Ravioli. This dish satisfied a craving that I didn’t even know I had! The tender braised beef melted in my mouth. The Marsala sauce had a rich buttery flavor that was slightly sweet with a creamy texture (In one word it was decadent). The table shared the Chopped American Salad (because the portion was so large) with an Avocado dressing. Not only was it delicious but the price of $9 makes it a viable option to Chopt. The Crab Cakes were fabulous – they were made with lump crab meat and very little bread crumbs. My companions both chose Seafood for their entries. First up was the Sea Scallops w/sautéed baby spinach over mashed potatoes. The Scallops were done to perfection (not over cooked) and the white wine butter sauce complimented the dish – overall just a wonderful blend of tastes. Next up was the Seafood Risotto, which our server said was very popular and we could see why. The portion was large and all the fish was done to perfection (not rubbery). The broth added just the right amount of flavor without overpowering the dish. I give Kisco River Eatery my highest recommendation and would urge you to try it yourself if you haven’t already. I understand that they have just started to offer Brunch on Sundays from 11:00 to 3:00 – I will definitely have to try this. Forget about Mini-Bagels you have to try the newest creation from Anthony Sinapi called Bagel Puffs. They are miniature versions of a traditional Bagel without the hole; instead they are filled with cream cheese or butter. Perfect for the commuter or Mom on the go. The size is perfect and there is no mess. I ordered 2 dozen for a business meeting and they were a huge hit. It saved me a lot of time since I didn’t have to bring along cream cheese or butter (and no knife was needed) – just bite and go. The only problem I see is that- you can’t just eat one! I spoke with a Mom who said the size was perfect for her 3 year old to hold in his hand during car rides (kept him tantrum free on his ride to pre-school).Personally I thought the center would be mushy, boy was I wrong – the center definitely stands up to the robust filling. Don’t take my word for it get to Sinapi’s and try them yourself. Although I hadn’t worked in the Emergency Room for a number of years, I put on my lab coat and walked the four blocks, certain they would need my help. Not only were we a level one trauma center, we were the burn center for Manhattan. I confirmed that my family was safe and I was mentally preparing myself on the walk over for the mass casualties that would be pouring in by the dozens. Hundreds even. The ER was packed with physicians and nurses. Empty stretchers was were lined up with IV’s primed and waiting. We were ready. Waiting. Any patient who could possibly be discharged was sent home. We were ready. The first tower had not yet fallen. We were waiting. Where were the casualties? We reasoned that they must be taking them to the nearest hospitals first. Perhaps they were treating and stabilizing near the scene in a giant makeshift triage area. We waited. Some victims with severe burns came through, but went directly up to the burn unit, to beds that had been emptied and made ready. As we waited for the victims, we all gathered in the waiting room, where the only television was broadcasting the events as they unfolded. Now the pentagon. Now the crash in a field. What was happening? Where were the patients? We were ready. We were waiting. As we saw the image of the first tower collapse, we let out a collective gasp, as hands covered mouths or grasped heads. “Oh my God!” Slowly, a few victims trickled in. Some EMS workers, first responders and people on the periphery, with respiratory distress and eye irritation from the smoke and dust. I irrigated the eyes of one of our own EMS workers who was covered in grey soot. He tried to tell me what he had witnessed, but broke down in tears. I hugged him. I stayed until midnight. Maybe there would be survivors found buried in the rubble. I came back the next day, this time in a pair of stolen scrubs that I still had at home. The same empty stretchers with the IV’s ready were still there, waiting for those who never came. It was finally sinking in. They were all gone. This was written by a friend Mark Corpron who worked at Weil Cornell – New York Presbyterian . Thank you Mark for this moving piece. What an energetic crowd showed up today for the opening of Modell’s in Mt. Kisco . The first 150 patrons were treated to a $25.00 Gift Card. Bianca and her brother Wyatt were two of the lucky ones. Mitchell Modell proudly showed off his stores Large selection of Athletic shoes. State Assemblyman David Buchwald , The Mayor Of Mt. Kisco Michael Cindrich and Chairperson of Recreation Linda Cindrich all came out to congratulate Mitchell Modell with the opening of his Store. This has been a very active Month in Mt.Kisco and surrounding areas with new businesses opening up.The long awaited opening of the old Borders site will happen this Thursday when Modell’s finally opens. Although there have been mixed feelings about this store opening, most agree it will be wonderful to see this corner of town bustling again. Another business located just down the street is the Mount Kisco Meat Market that will open early next month. Just slightly out of town you will find a fantastic Vietnamese restaurant called Pho Corner. They have free delivery and offer catering. Here are some photographs of my mother, Margaret, between 1959 and 1991. She was a very strong, liberal, and independent woman. A Massachusetts Democrat. Outspoken. A Union member. A real-life Norma Rae or Maude. Ahead of her time. My mother was a great woman who had a difficult childhood because Margaret’s father died in 1924 at the age of 28 when she was only 4. Before her father became too ill from what was probably diabetes, he drove the family to Florida during the last few months of his life: Driving from Boston to Lake Okeechobee and back must have been a fun adventure in 1924! Margaret was an only child and was raised by a single parent. The statuesque Margaret married the love of her life in 1938 and that union produced three children. However, before the youngest was a teenager, their young father died, leaving Margaret to become a second-generation single mother. Margaret was very talented and skilled with a Singer sewing machine and she would make beautiful clothing for both men and women, thereby supplementing the income she earned at the textile mills. The money was needed to support her family of four. Margaret certainly made stylish dresses for herself and children (even her daughter’s wedding gown) and was a remarkable cook, gardener, best friend to a few, and regular beachgoer. 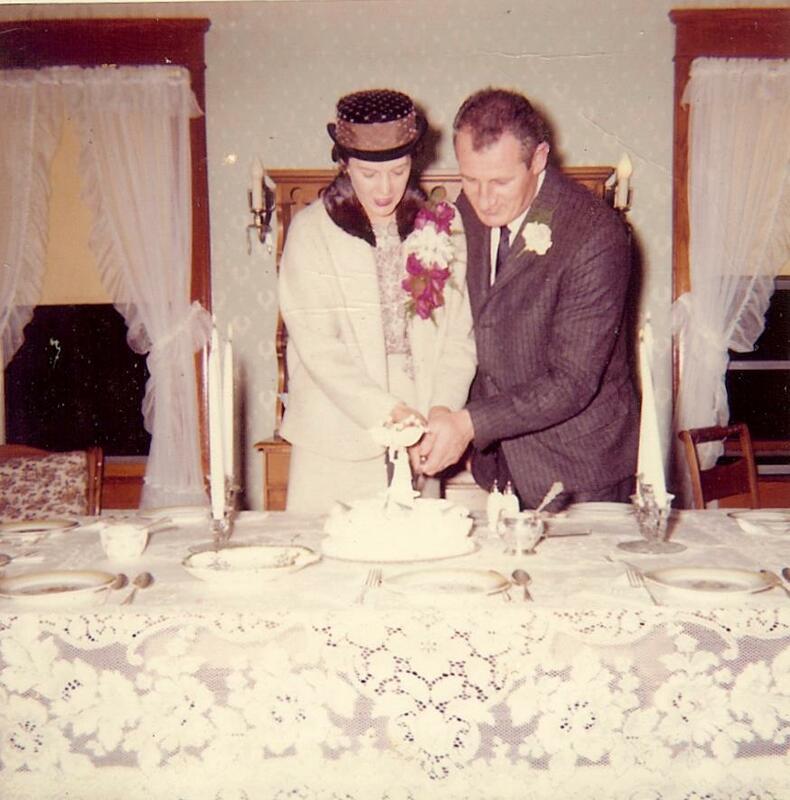 In the late 50’s my parents married and Margaret finished her three decades (30’s, 40’s, & 60’s) of childbirth. However, shortly thereafter, Margaret returned to the single mother role…a successful role, once again. Margaret worked hard to support her family of two. Relatives thought that I just might not make it to age six because of high tension levels between mother and son-all unsubstantiated, I say. It was very difficult for Margaret to work in the un-air-conditioned mills and to deal with the ‘change’ – I know first hand that her hot flashes seemed to last most of my adolescence…they were real and they occurred often, and they created a lot of tension. In the late 70’s Margaret’s diabetes and other medical issues allowed her to retire early and to let her begin to regain her strength. 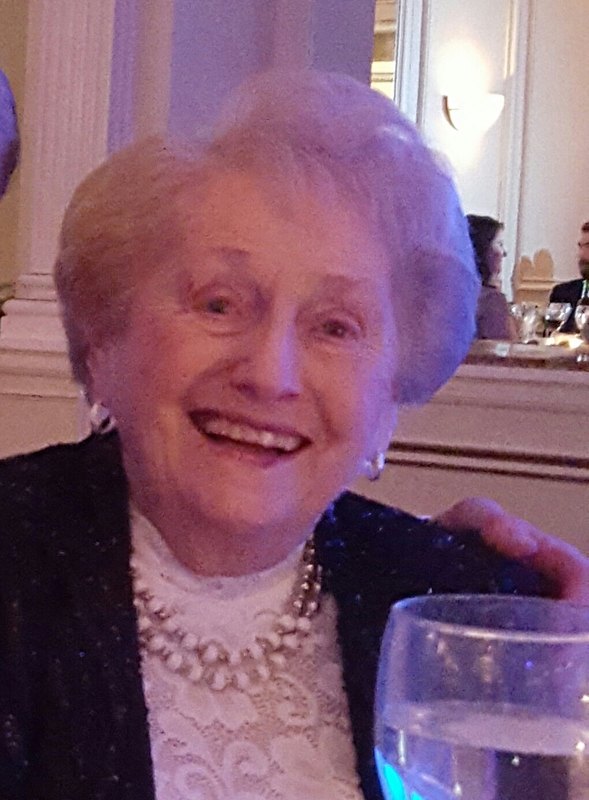 Margaret had four children; eleven grandchildren (many more great and great-great since her passing and her 12th grandchild was born in 1997) and everybody always included her with the family events and trips to Cape Cod. By 1984 or so Margaret moved into Elderly Housing in her hometown and that marked the first time she lived alone. Margaret enjoyed life there as it was convenient and she learned whom to avoid but befriended the good neighbors. We lost our mother in July 1991. She was 71 and I was only 29. RIP Margaret Rosanna. We miss you. 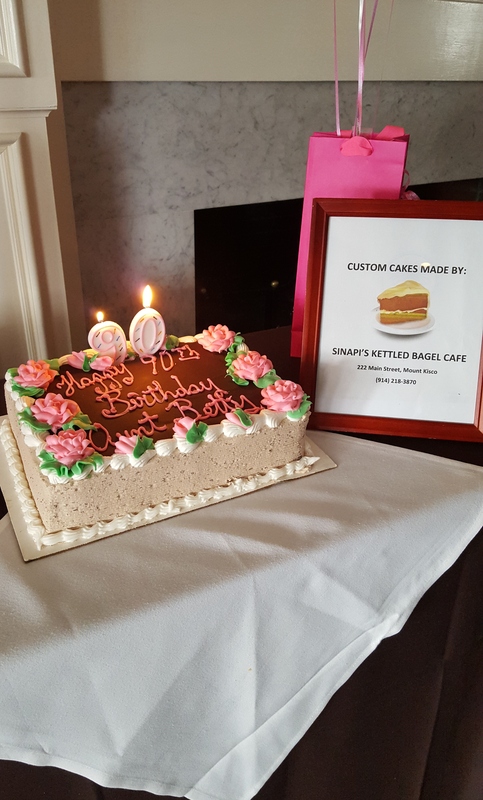 Aunt Betty’s Birthday request was for a Strawberry Short Cake and a Napoleon. Now I have to mention that Betty can sometimes be a little ‘Strong Minded’, and I was a bit apprehensive with given the task of getting these cakes for her celebration. I knew I need to call in the Big Guns – Anthony Sinapi from Sinapis Kettled Bagels Cafe. If you haven’t tried his cakes and pastries you are really missing something. Anthony is a master baker and uses only natural and fresh ingredients. How many times have you been lured into purchasing those great looking pastries from the supermarket bakery only to be disappointed when you realized that they taste like sh**. Have you ever been shocked how the icing stained your kids’ teeth and cloths from those large sheet cakes purchased from the big Warehouse Stores? 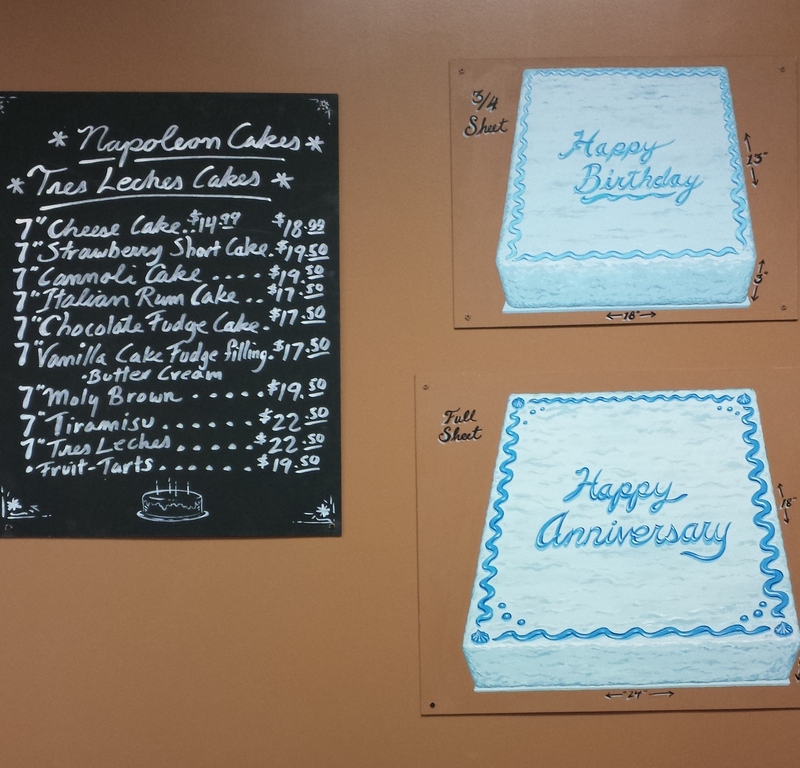 Do yourself a favor and order your next cake from Sinapis’s. You can’t beat the price and quality of the ingredients that Anthony uses. Watch out Buddy Valastro,there is a new ‘Cake Boss’ in town! If you’re looking for some Homemade Soups or great Sandwiches try Sinapis for lunch. In a rush, can’t find a parking spot, why not try the ‘Curb Side’ pickup service. Just give them a call and your order will be delivered right to your car – no need to even get out. Have an issue with Gluten, try Anthony’s Gluten Free Bagels. 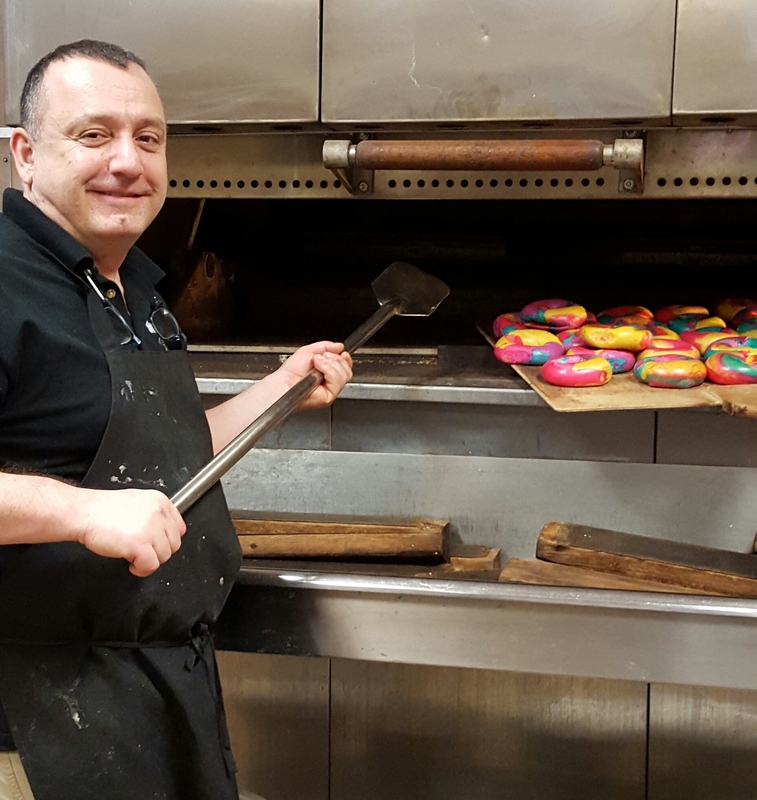 Rainbow Bagels and Funfetti Cream cheese were available for the first time last weekend and boy were they a hit (24 dozen were sold in the first hour) No need to travel to Brooklyn – ‘Mt. Kisco Has It’.